Gold Cats water taxies passenger ferry. Crossing time 25 mins to One Mile. Arrives at One Mile (on outskirts of Dunwich) and met by bus. Approx. 20 mins to Point Lookout. Stradbroke Ferries' water taxies (passenger). Crossing time 25 mins to Dunwich. Arrives at Dunwich main jetty and met by bus. Stradbroke Ferries' car & passenger ferry. Crossing time 45 mins to Dunwich. 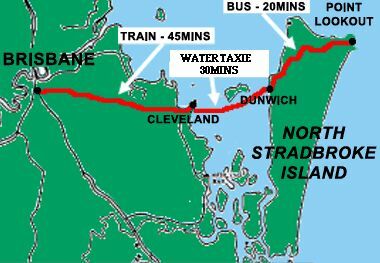 Travel time by car from Dunwich to Point Lookout 20 mins. Location of bus stops and workshop venue. You can try asking the bus driver to let you off near Midjimberry road or the 'Look" cafe. Otherwise go to the final stop near Moongalba Road and walk back along Mooloomba Road (sea on your right) to Midjimberry Road. Turn left into Midjimberry Road a. A few yards down the road on your right look for a blue and white sign hanging from a tree saying 'Carolina'. Go up the stone path and bear left at the fork in the path. Welcome!